James Gummer began playing drums in 1987 and is proud to be part of the original MTV generation. He has played everything from Metal to Jazz to Traditional Irish music. 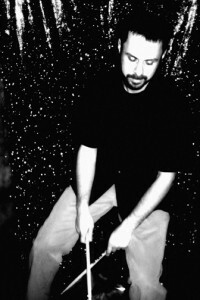 James has studied with drummers such as Dr Bill Watson, Wes Crawford, and N. Scott Robinson, and is now a teacher himself. He teaches privately and is the drum and percussion instructor at The Saint James Academy in Monkton, Maryland and EMC in New Freedom, Pennsylvania. He has performed with many bands throughout the Baltimore – Washington area and beyond including the Corrupted, The Doug Mattingly Band, Krytonik,Tradewindz, and with Celtic Music legend Maggie Sansone. He has played various productions such as the original Ballets, Excalibur and Celtic Christmas Suiteswith the Ballet Theater of Maryland, Twistin’ to the 60’s at King’s Dominion in Doswell Virginia, and the American premier of Six Dead Queens and an Inflatable Henry. James has also been the resident drummer at the Maryland Renaissance Festival since 1997 and is currently playing hand drums and percussion as an accompanist for The Community College of Baltimore County’s dance department. James is also a trained Remo Health Rhythms Drum Circle Facilitator and a founding member of The Drum Runners. Contact him directly for more information or bookings. 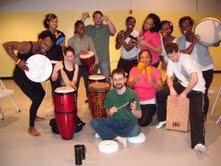 Private and group lessons are available as well as rhythm circles for wellness, healing, and fun! For Health Rhythms Drum Circles click HERE.